Could Fleetwood Mac be set for a Glastonbury 2019 surprise appearance? Emily Eavis said Fleetwood Mac will NOT be headlining Glastonbury 2019 – but… how about a special surprise appearance? Fleetwood Mac has announced details of their 2019 European tour – which include a massive stop at London’s iconic Wembley Stadium. 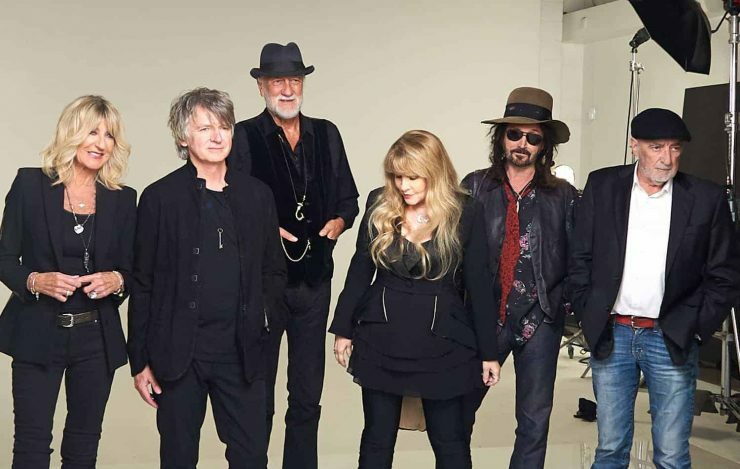 Featuring the newly announced line-up of Mick Fleetwood, John McVie, Stevie Nicks, and Christine McVie, alongside newcomers Mike Campbell and Neil Finn, the iconic band will hit London’s Wembley Stadium on Sunday 16th June, with Dublin and Berlin taking place 3- and 10-days prior. The ‘Dreams’ band are currently touring with a new line-up of Mick Fleetwood, John McVie, Stevie Nicks, and Christine McVie, alongside newcomers Mike Campbell and Neil Finn – this after guitarist Lindsey Bucking was sacked back in April due to “scheduling conflicts”. The classic rock veterans will hit London’s Wembley Stadium on Sunday 16th June, with Dublin and Berlin taking place 3, and 10-days prior. It is needless to say that an announcement of this nature would typically push the Glasto Rumour Mill into overdrive with vast speculation of the legendary band finally headlining Glastonbury Festival’s iconic Pyramid Stage. However, earlier this month it was reported that Emily Eavis had stated that the band had not been booked to headline Glastonbury 2019. That being said, Eavis did say the band are NOT set for a headline slot (whilst also confirming the Sunday Legends Slot WILL be a non-UK female artist), she never said a special appearance is out of bounds – did she now…? “Fleetwood Mac has always been about an amazing collection of songs that are performed with a unique blend of talents,” said Mick Fleetwood. “We jammed with Mike and Neil and the chemistry really worked and let the band realise that this is the right combination to go forward within Fleetwood Mac style. See Fleetwood Mac’s upcoming UK and European tour dates below. Tickets go on sale HERE from 9am on Friday October 26.